Dog Eared Publicity: Book Blast: My Walks with Bentley by d.c. charles - Win a $25 Gift Card! Book Blast: My Walks with Bentley by d.c. charles - Win a $25 Gift Card! Dogs and people are a natural combination. A love born in childhood can change a life forever. 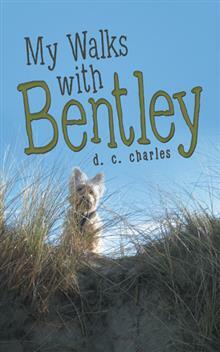 My Walks with Bentley captures life lessons author D. C. Charles learned from her dog, Bentley, while on their walks. Bentley's reverence for a neighborhood tree causes Charles to reflect on nature. When they take up temporary residence on a peninsula, Bentley makes friends, though he turns out not to be much of a beach bum. And from the time they board a plane for their move to France, Bentley helps smooth the transition by making friends and enjoying the city of Paris-well, except for the sidewalks-before moving to their new home in the countryside. And he learns French long before the author does! My Walks with Bentley is a fun read. It reminds us to expand our perspectives. The world looks very different when one is closer to the ground, and we can learn from those more grounded. d. c. charles studied speech communications at California State University Northridge. Although she had one career in mind based on her studies, life took her on another path. After the sudden passing of her husband in 2000, she left her career of more than twenty years to discover her passion. This path led her to live in France, which inspired her writing. She is currently working on other book projects and blogging. d.c. is giving away a $25 Gift Card!